It is clear from a comparison of GHRH with other members of the series that its active center comprises the N-terminal hexapeptide region. Early studies also quickly ascertained that the C-terminus could be shortened (2,12) only up to position 29 with retention of almost full potency. Reduction of chain length beyond Arg29 yields analogs with full intrinsic activity down to position 20 and full loss of activity beyond that point (31,32). Fig. 3. Chou-Fasman conformational analysis of GHRH(1-29)NH (top panel) and [D-Ala , Ala8,9,15,16,18,22,24-28]GHRH(1-28)NH (JF-01-40; Table 2) (bottom p^nel) showing the resulting increase in helical probability along the sequence of this potent analog. Hydrophobicity analysis demonstrates how the hydrophobic domaines of the analog are accentuated relative to GHRH(1-29) and are separated by the basic, hydrophilic Arg-Lys sequences. The demonstration (33) that GHRH(1-29)NH2 is just as potent as GHRF(1-40) in both normal subjects and patients with growth hormone deficiency (GHD) confirmed that this was an excellent sequence choice both for subsequent synthetic and biological studies. Based on conformational analysis of the GHRH sequence described in the previous section, two of the first studies (34,35) undertook the individual replacement of the first 8 amino acids in GHRH(1-29)NH2 with D-amino acids. The resulting analogs were bioassayed for stimulatory effects on GH release in the anesthetized rat and, surprisingly, the D-Tyr1, D-Ala2, D-Asp3, D-Ala4, and D-Asn8-analogs were all far more potent than the parent peptide. In fact the D-Ala2-GHRH analog was up to 50 times more potent than the native sequence and this was attributed to increased receptor affinity and perhaps the stabilization of secondary structural features at the N-terminus. It was not until later when the same analogs were tested in in vitro systems (36) and found to have only modest increases in potency that it became clear that the high in vivo potency was primarily owing to inhibition of dipeptidase activity. Several of these D-amino acid-substituted analogs were also much more potent in cows (37) as in the rat. Unfortunately, this was not found to be the case in humans where D-Ala2-GHRH(1-29)NH2 is only about two times more potent than GHRH(1-29)NH2 itself (38,39), and Ac-D-Tyr1,D-Ala2GHRH(1-29)NH2 about equipotent (40), thus suggesting major differences between metabolism and clearance rates of these molecules among various species. The N-acetylated version of GHRH(1-29)NH2 was also about 10 times more potent in the rat (34), and the N-terminus of GHRH was not at all sensitive to acylation or alkylation. A report (41) that both the ^-acetyl and D-Tyr1 analogs of GHRH(1-40) had extremely low in vitro biological potency appears to be in error. The D-amino-acid substitution strategy was continued further down the peptide chain to give a complete "scan" of the chain (42). It was found that D-amino acid substitutions in positions 10, 25, 27, 28, and 29 resulted in complete retention of in vitro potency. N-terminal conformation at positions 7-8, 8-9, and 9-10 (where potential folding is indicated by Chou-Fasman analysis (see Fig. 3), was further probed by incorporation of a rigid bicyclic P-turn dipeptide unit at these positions (43). Although all analogs were full agonists, there extremely low potency provides some evidence against folding at these points, although the side chains of the amino acids involved were also drastically altered. 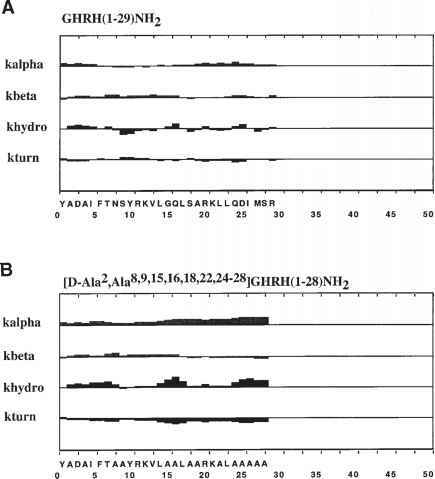 The susceptibility of GHRH to dipeptidylpeptidase enzyme was also addressed by the substitution of amino acids other than Ala in position 2 (44). Substitution with either Ser, Thr, or Gly resulted in much enhanced stability; however, undesirable effects on receptor affinity appeared to result. Attempts to modify/stabilize the actual peptide bond CONH units between several N-terminal amino acids via incorporation of the CH2NH group (45) drastically reduced antagonists potencies, although the 9-10 replacement analog was a receptor antagonist at rat pituitary cells. There are, of course, numerous other portions of GHRH susceptible to proteolysis, particularly the tryptic cleavage sites provided by the two pairs of basic amino acids (Fig. 1). We carried out the modification of the epsilon-amino groups of the two Lys residues by reductive alkylation with various ketones and aldehydes (36), and were surprised that potencies were readily retained even in the presence of bulky substitutions, including long alkyl chains and cyclohexyl groups. This suggested that these residues are not in close proximity to the receptor in the bound state. 2,3-dihydroxyisopropylation of the Lys residues (46) either together or individually gave analogs with much superior in vivo properties. Derivatization of either the amino terminus, each of the two Lys residues and Asp in positions 8 and 25 with polyethylene glycol chains was also investigated (47). The amino terminus, Lys21, and Asp25 could be acylated with these long polymer chains with little loss of potency and presumably binding affinity in vitro. The in vivo activity of these analogs was not investigated, however. There have also been attempts to prevent proteolysis of GHRH(1-29) from its C-termi-nus. C-terminal alkylamide analogs were reported to have good in vivo potency (48). The C-terminal Arg residue was replaced with agmantine (the des-carboxy derivative of Arg) in many analogs containing D-amino acids at the N-terminus and blocked N-termini (49). As with most N-terminally stabilized-analogs, these were up to 70 times more potent in vivo in the rat; however, no in vitro or binding data were presented. Because even D-Ala2-GHRH(1-29)NH2 displays comparable levels of potency to these analogs in rats, it seems unlikely that they would be as potent in humans, since D-Ala2-GRH(1-29)NH2 is not.